Christmas tree for your desktop. Is there a better alternative to X-MasTree? Is X-MasTree really the best app in Desktop category? Will X-MasTree work good on macOS 10.13.4? X-MasTree is a Christmas tree for your Mac. There are many options, including which color lights to display, lighting modes (static, blinking or fading), a few ornaments, and a badge displaying days left until Christmas. WARNING: setting the lighting mode to "fade" will beat the living snot out of your CPU. Fixed "Days left until Xmas" bug. Added the ability to choose January 7th as the date to celebrate Christmas (as per some Orthodox traditions). 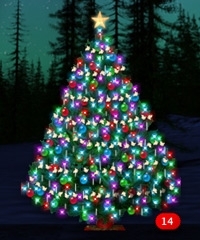 Download X-MasTree 1.2 for Mac OS X 10.3. X-MasTree needs a rating. Be the first to rate this app and get the discussion started!